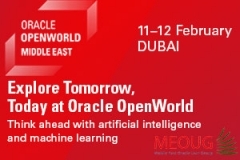 The MEOUG is pleased to announce the MEOUG MAJLIS 2017 Annual User Conference, organized by the Middle East Oracle User Group. This conference will be held on 22-23 March 2017, in Dubai, a beautiful region of UAE. We look forward to welcoming you all in MEOUG MAJLIS 2017 Annual Conference 22-23 March 2017 are the best times to visit the Dubai - UAE. Enjoy the Annual Conference and attend one to one session with ORACLE Experts during the conference.